It's hot. It's sticky. It's humid. It's summer time! Oh, the joys of boiling in the heat. ;) If you couldn't already tell, summer isn't my favorite season by a long shot, but you can still enjoy it with a few essentials! These are my personal must-haves for the hot summer months. Kimono: If you didn't know already, I am majorly obsessed with kimonos. They are so light, airy, and versatile. You can throw them over anything and instantly have a put-together outfit. They are everywhere in stores and come in many different colors and patterns. I can't get enough of them! They're perfect for these hot, sticky, summer months because they're so flowy and thin. You can throw them over a tank top and a pair of capris and call it good. Straw Hat: I've become quite fond of hats recently and a straw hat is a great summer essential because it's light and there are tiny holes throughout making it easy for a nice breeze to flow right through. If there's actually a breeze, that is! ;) You can wear straw hats with anything and they just look adorable. They also serve a purpose by keeping the sun out of your eyes. Sandals: Sandals are just such lifesavers. They are open, so they keep your feet cool while you're walking around in the hot sun all day. My favorite sandals are Croc sandals. No, I'm not sponsored, I just really love Crocs. I have these Croc sandals and I wear them all of the time. I wear them pretty often in the summer because they go with anything and they are light and easy to slip on and off. Scrunchies: I've loved scrunchies since I was a little girl. I have really thick hair and I find that they pull and tug less on my hair when I need to throw it up in a bun or pony tail. They also come in many different patterns and colors, which I love. You know me! I like to coordinate with my outfits! ;) I wear my hair up in a messy bun pretty often in the summer, so scrunchies are a must-have for me. Iced Coffee: Oh, man. I LOVE coffee so much! I need that caffeine to get me up in the morning and get a start on my day. Iced coffee is a glorious thing when it's hot outside. I find that when I drink coffee straight out of the pot, I end up sweating and get so hot and toasty when it's already too warm outside. When I drink iced coffee, I'm much more refreshed and cooled off at the same time. Caffeine is important, ladies! Am I right?! Waterproof Mascara: They say that the eyes are the windows to your soul. I want my eyes to look fluttery and full when people look into my soul! Haha While waterproof mascara is a pain to scrub off, it's also a lifesaver at the same time. When you're out in the heat and sweating to death, your mascara won't budge. Setting Spray: This stuff is just magical! After I do my makeup, I spritz my face a few times with this stuff and my makeup stays put. I absolutely love it. It's so nice to know that your face won't melt when you're out and about sweating yourself to death. I highly recommend it. Right now, I'm really loving the Loreal setting spray. It's pretty fabulous. Sunscreen: Ladies! If you don't do anything else to protect yourself from the sun, please at least wear sunscreen! It will protect your precious skin from the damaging rays. It will protect you from skin cancer and sunburns. Trust me. A few years ago, I got sun poisoning because I did not lather on that sunscreen. I regretted it more than anything. My skin was red, swollen, puffy, bruised, and full of boils. It was a very painful experience. Wear. Sunscreen. Please!! Tinted Lip Balm: I am a lipstick lover, but sometimes I just feel like it melts off when it's boiling outside. My favorite lip product for the summer is a tinted lip balm. Not only is it moisturizing, it gives off a nice color without being thick and heavy. I recommend looking for a tinted lip balm with sunscreen in it. Your lips can burn too, so it's important to protect those babies! Do you have some summer essentials that I haven't mentioned in this post? Let me know in the comments! 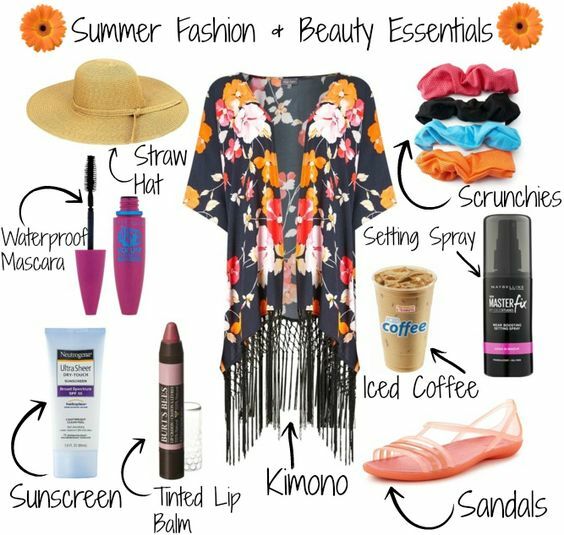 A perfect combination, that's all what I need for this summer (I love the kimono you picked! ), an ice coffee is a total must have!